Featuring a dropped shoulder, an extra wide boxy body and fitted sleeves, our Seamed V has that perfectly flattering cut. And the details set it apart: exposed seam details cross at the front and back, a deep V and a stepped hem with mini side slits. 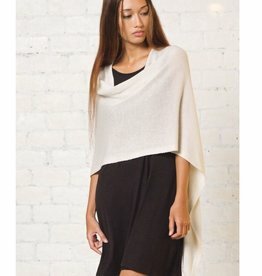 • Wear it over wide leg pants while out to brunch with the girls for a comfy Sunday look. Then, pair with slim trousers for a casual office look. • 60% cotton, 40% acrylic. • Machine Washable Gentle. • Imported.